He's got a mouth on him. He’s the first Noxian Yordle, one of a rare batch of tag team champions, and the one and only champion to have a censored swear word in the game. He’s a personality like none other you’ve seen in League of Legends, and his kit’s pretty neat too: say hello to Kled, the Contemptuous Canker, and the game’s newest champion. Riot have been hyping Kled up for weeks through a viral campaign of posters, where the Noxian folk hero looked for his cowardly mount, Skaarl. Now they’ve been reunited, and it feels so good. Here’s a look at Kled, and how he represents a new frontier for League’s champion design. When mounted, Skaarl takes Kled’s damage, and flees when his health bar depletes. Skaarl can benefit from bonus health as a stat, but Kled can’t. When Skaarl flees, Kled is dismounted, and must regain Courage with his modified solo abilities until he convinces Skaarl to return. When mounted, Kled throws a beartrap that deals damage and hooks a champion or large monster, nuking minions on the way. When he grabs a champ, he slows them and pulls the enemy closer to him. When Kled’s on his own, he has a ranged pistol that restores Courage. Now, here’s where things get interesting: Kled’s kit is linked to Skaarl to an unprecedented degree. Whereas there’s been locked abilities before, like Kalista’s W and R, and Yasuo’s R, Kled permanently loses half of his kit if he doesn’t have Skaarl with him. This causes damage to enemies in Kled’s path, grants him movement speed if he collides, and he can reactivate to dash back. While Ahri throws a projectile, Kled and Skaarl are the projectile. Kled charges towards a location, and, like Sivir’s ult, leaves a trail of movement-boosting speed in his wake. He gains a shield and rams his targets for maximum damage. This could potentially be a massive game changer in competitive—Sivir’s ult is notorious as an ability that lets you “group and win”. Realistically, we don’t know how Kled is going to play out yet, but we do know that he has been designed to be a top. This especially makes sense with the lane swap changes. Kled might struggle against a Caitlyn and Janna in the top lane, but he can go toe to toe with a Gnar or a Renekton (in theory!) Combine this with his health percentage damage, and Kled might carve out a secondary carry niche on top lane. That being said, all of his safety is tied into Skaarl—if he loses his mount, he loses all his extra bonus health, and all of his mobility. He just becomes a wild little dude with nothing to lose at that point, firing off projectiles and stabbing and hoping for the best. It’s possible he might end up in the jungle, but if he loses Skaarl, he can only get Courage back from lane minions, and not jungle monsters. There’s also the possibility that Kled could end up as a wildcard kind of support. After all, he has a hook and snare with a slow attached, a serious speed boost and self shield on his ult, and base percentage damages. Of course, many of those utilities could work really well on a jungler as well—a speed boost charge, a CC ability, and a steroid to dish out damage. Kled has a few places to end up, and while top’s the intended destination, it could go a lot of ways—after all, Vi was originally meant to be up top, but she rapidly found her home in the jungle, and there’s days of PBE tweaking yet to come. Kled is a real one of a kind when it comes to personality—I mentioned the bleeped line earlier, and that’s only one of the cusses in Kled’s arsenal. He drops essentially everything but the f-bomb, and if you listen to his voice on YouTube, it’s about twenty minutes of wild screaming about everything from Kled’s stolen ranks to how great Noxus is to how terrible yordles are to gibberish. and then wild, evocative threats ripped straight out of the Borderlands series. Kled is a champion who is going to come across wildly different in game, as the YouTube that has been ripped is just all of his lines in order. In game, Kled has lines both mounted and unmounted, in response to champion jokes and after sniping certain champions down across the field. It’s a more organic, fun way to display a champion’s personality, and holy hell does Kled have a lot of personality to show off. While Riot has been working overtime to come up with compelling characters who say a lot about the world around them, Kled is a change of pace. This isn’t to say that he’s badly designed, but he’s shallow. Jhin is another psychotic killer, but he’s a man of secrets behind a mask crafted by the Ionian government. Jhin is hunted by one faction while serving another while looking for a way to serve the dark urges that rule his mind. He’s addicted to violence and the beauty of death. 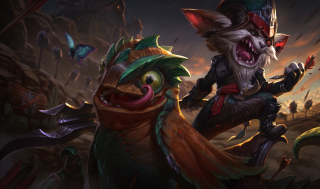 Kled, meanwhile, is a little guy hopped up on drugs and brain badgers riding a giant lizard and stabbing people and stealing their military titles. Say hello to the League of Legends, Kled. You, and your trusty mount, will be honoured for years. Let’s lift a goblet of mushroom juice to the occasion.